This just in: I officially have enough Delta Sky Miles to go anywhere in the continental USA! I am also 1,000 miles away from having a free flight on Continental (read: my favorite domestic airline!!!) And luckily for me, you can buy 1,000 miles for a mere $50 - so i'll be doing that shortly! Because $50 is close enough to free in my opinion (when i haven't found a flight for less than $175 in the past year). Which means all of my time and money going into these companies may have finally paid off - i get to go on two trips for free. On another free trip alert: Delta royally screwed up my flight back from Wichita . They overbooked my flight by 15 people, and didn't have another available flight back from Wichita to Ft Myers until 4 days later. First Class from OKC - ATL // ATL - RSW. and $400 in FLIGHT CREDIT. First Class - my first time in first class, might i add - was cool. This was pretty much what happened. - Sat down in my larger, extra leg room: Ooo. This looks cozy. But i'm 5'2'' - does it look like i need much extra leg room? 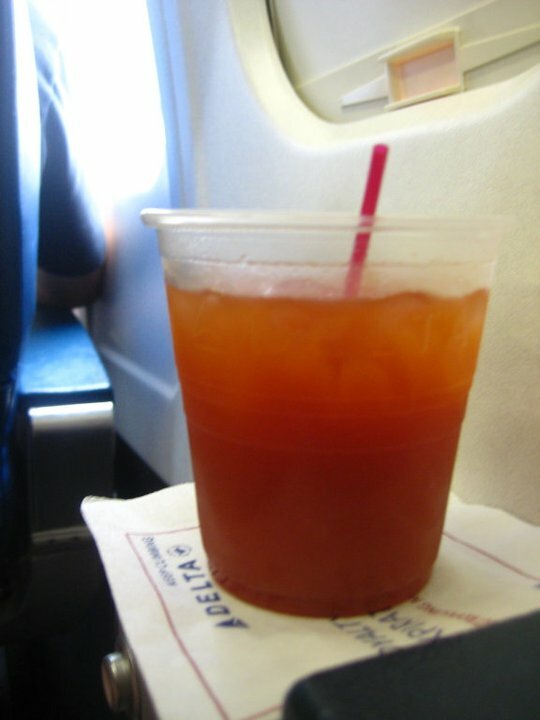 - Attention from Flight Attendants: Yes, a water prior to take off would be lovely. And you'll put my bag in the overhead bin for me? Muchos gracias. - Flight Attendants Checking on you every 5 min: I'm fine!!!! I just got here! Leave me alone i don't need another drink. Oh, but that free banana and bag of Sun Chips look nice. Thanks! and this was all prior to take off. i felt very fancy! and it was comfortable with my complimentary blanket and pillow in my extra large seat. but i'd never ever ever pay more than a $50 upgrade charge to do it; average domestic round trip first class tickets are 60-75% more expensive than normal flights - and all you get is about $25 in added value. maybe $50, if you keep the drinks flowin. Now - where to go with my 2 freebies and $400? Any suggestions? Unfortunately none of this is applicable to foreign travel.... so looks like i'm keepin it States side! that is where you should come/go with those vouchers. in fact, i heard you're looking for a new place to live. you can just get a one way. i'll share my bed.